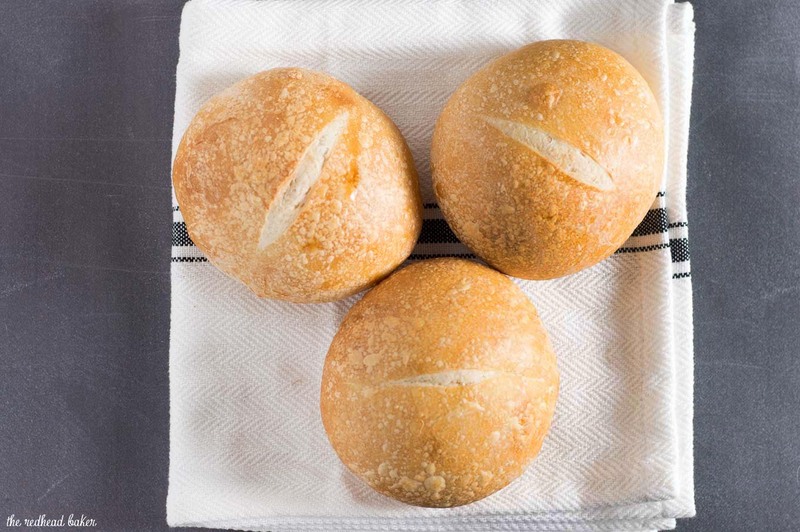 Crusty French rolls get their texture from a long rise in the refrigerator. Make them small to serve with dinner, or larger to hold a sandwich or burger. It’s amazing how something so simple can be so delicious. French bread consists of just four ingredients: flour, water, salt and yeast. 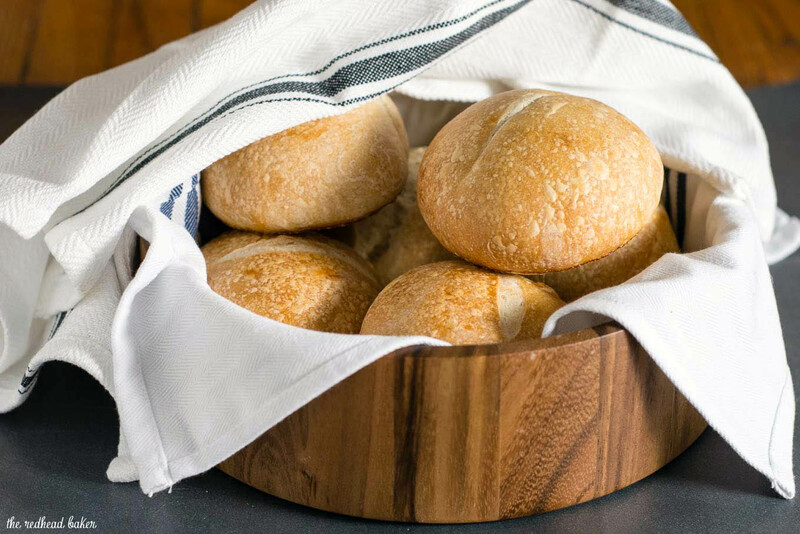 It can be shaped into baguettes, a loaf, or a classic dinner roll. 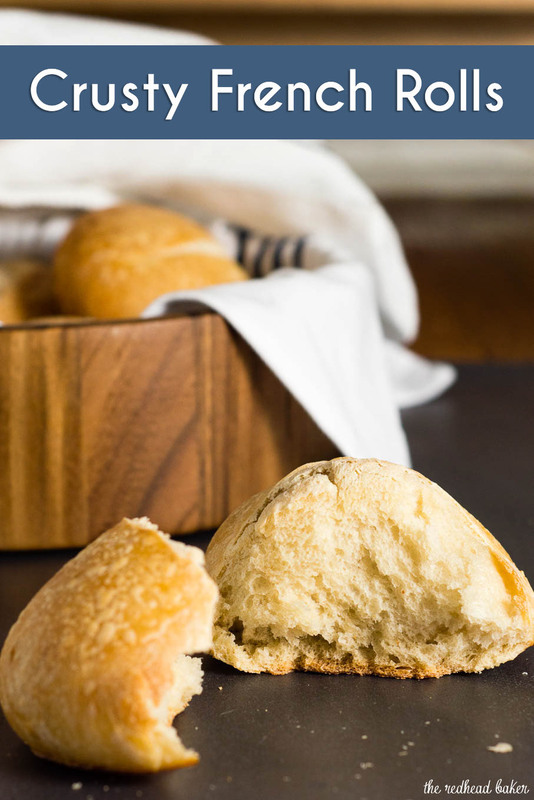 I wanted crusty French rolls for a recipe I’m posting this coming Tuesday, but I couldn’t find anything in stores that matched what I had in mind. So, I decided to make my own. The culinary school I attended was based on traditional French cooking techniques, so I adapted the French bread recipe I found in my pastry school cookbook (yes, I still have it!). Our school had a pastry shop where we sold the things the students made: cakes, cookies, pastries, and bread. The recipes are written for large-batch baking (4 pounds of flour, anyone? ), but they can easily be scaled down. At my school, we had a commercial oven with a built-in mister (sprayed water over the bread as it baked) to give it a nice, crunchy crust, but I don’t have that option in my oven at home. But you can still get a good crust on your bread without one. A long, slow rise in the refrigerator paired with an egg wash of egg white plus water is one of those methods. Other ways involve placing a pan of water in the oven with the rolls, or opening the oven door and misting the rolls with a spray bottle. As written below, this recipe will yield six rolls about the size of large hamburger buns. You can divide the dough into twelve smaller pieces instead, which will be about the size of a standard dinner rolls. Just shave about 5 minutes off of the baking time. 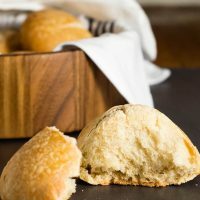 I made these rolls entirely by hand, without a mixer or bread machine. For a video tutorial on how to knead bread by hand, please see this post on pizza dough by hand. Place the ingredients for the starter in a large mixing bowl and mix until smooth. Cover the bowl with plastic wrap and let stand at room temperature overnight. The next day, add the remaining dough ingredients to the bowl with the starter. Mix until all of the ingredients are moistened. Transfer the mixture to a lightly floured work surface. Gather the dough into a ball and begin to knead in a steady rhythmic fashion, adding a tiny bit more flour to the work surface if the dough starts to stick. Continue kneading until the dough is smooth on the outside, springs back when pressed on with your fingers and is no longer sticky. Place the dough in a bowl sprayed with nonstick cooking spray. Lightly spray the top of the dough and cover with plastic wrap and a clean kitchen towel. Set in an area free of drafts and let rise for 1 hour. Punch the dough down, re-gather it into a ball, and replace the plastic wrap and towel. Let rise another hour. Repeat punching down, regathering into a ball, and let rise for a third hour. After the third hour, punch the dough down again, then divide the dough into 6 pieces of roughly equal size. 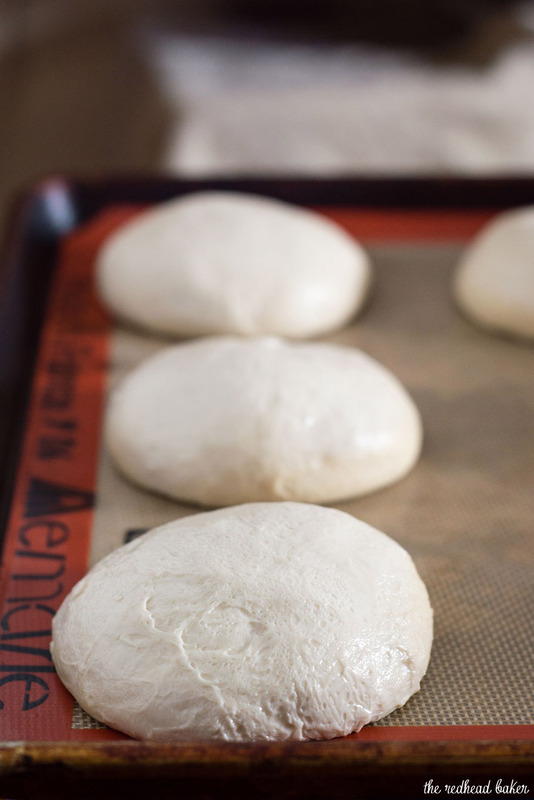 Form each dough piece into a tight ball, and place on a baking sheet lined with parchment paper or a silicon baking mat. Cover loosely with plastic wrap and let rise at room temperature for 2 hours. After 2 hours, transfer the baking sheet to the refrigerator and let the dough rise for another 3 hours. During the last 30 minutes of the refrigerator rise, preheat the oven to 425 degrees F. Prepare the egg wash by beating the egg white with the water until frothy. Remove the baking sheet from the refrigerator. Brush each roll with the egg wash. Use a sharp chef's knife to cut a shallow slash into the top of each roll. Put the rolls in the oven and bake for 25 to 30 minutes, until dark golden brown on the top. Turn the oven off and prop the oven door open, and let the rolls remain in the oven until cooled to just warm. 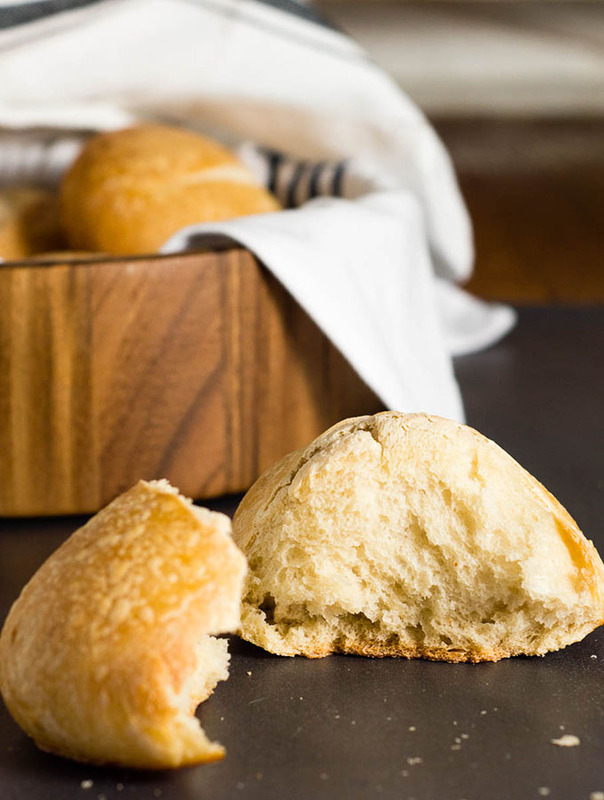 The rolls are best when eaten warm the same day they are baked, but they can be stored in a ziptop plastic bag at room temperature for up to 3 days.